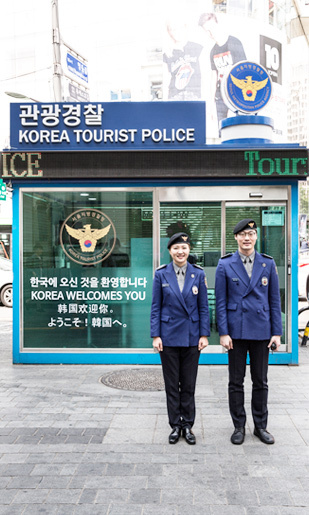 Tourist police assistance is available to international visitors at major tourist attractions, not only to prevent crime, but also to provide tour information and resolve any inconvenient issues. If you experience any misconduct or discrimination as a tourist, ask for help from the officers wearing navy jackets and black berets. Facilitate in handling any inconvenient experiences that may occur at tour sites. Interpretation service is available in English, Japanese, Chinese, and Spanish. Prevent and control misconducts such as overcharge on services and/or merchandise, operation of illegal taxis and call vans, and other acts of discrimination against tourists. Provide assistance with inconveniences: Facilitate in handling any inconvenient experiences that may occur at tour sites. Offer tour information and interpretation assistance: Interpretation service is available in English, Japanese, Chinese, and Spanish. Enforce law and order: Prevent and control misconducts such as overcharge on services and/or merchandise, operation of illegal taxis and call vans, and other acts of discrimination against tourists. By visiting any of the following Tourist Information Centers in person or calling the 1330 Travel Hotline directly, anyone can receive a friendly assistance from the tourist police officers.